Trustco Bank entered the Central Florida market from upstate New York where its roots date back to 1902. It’s a conservative, financially strong institution, and truly is a “hometown” kind of bank. Known as risk takers and innovative thinkers, our team proposed a bold approach, an aggressive campaign that challenged consumers to go in the opposite direction, and use this time when others were on the sidelines to plant the seeds for their growth. “Let’s Grow. Trustco.” was born. Illustration and consistent voice talent carried a cohesive theme through TV, print, outdoor, radio, online, point-of-purchase and direct mail mediums. 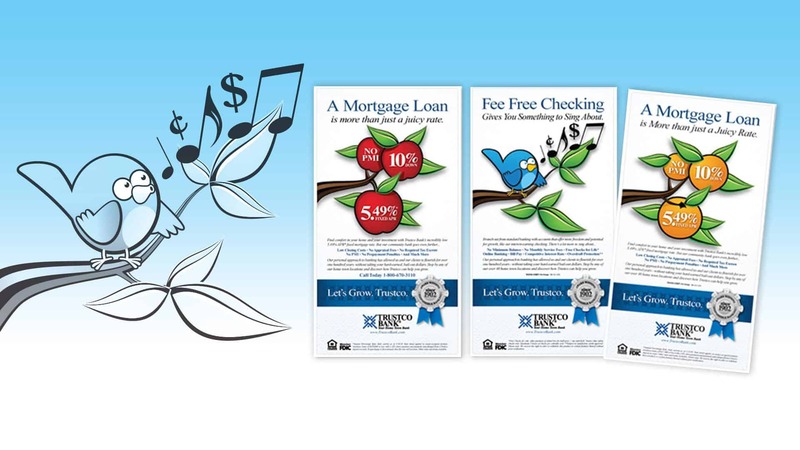 The campaign messaging was developed with two distinct audiences in mind–checking and mortgage customers. The visuals, similar in production for cost savings, were unique enough to focus the viewer on the key selling attributes and Trustco’s points of difference within each product line. Trustco tapped into evōk’s creative resources during a time of contraction by the competition. Capitalizing on the uncertainty of the market, evōk developed the tagline “Let’s Grow. Trustco.” to impart a reassuring message. In a time of financial doom and gloom, Trustco was the first bank in Central Florida with a positive appeal to growth in its efforts to attract new business. Over the course of two years, the bank has shown better than 20 percent growth, with the most recent branch opening setting a new all-time core deposit record–the largest increase since the company’s inception.